THE ONE by Mizrahi Developments breaks ground at Toronto’s Yonge and Bloor - Constantine Enterprises Inc.
Set to become Canada’s tallest building, construction on Mizrahi Developments’ THE ONE began today with a ribbon cutting ceremony held at the Yonge and Bloor development site in downtown Toronto. Once complete, THE ONE will rise 1,005 feet over the city’s iconic intersection. 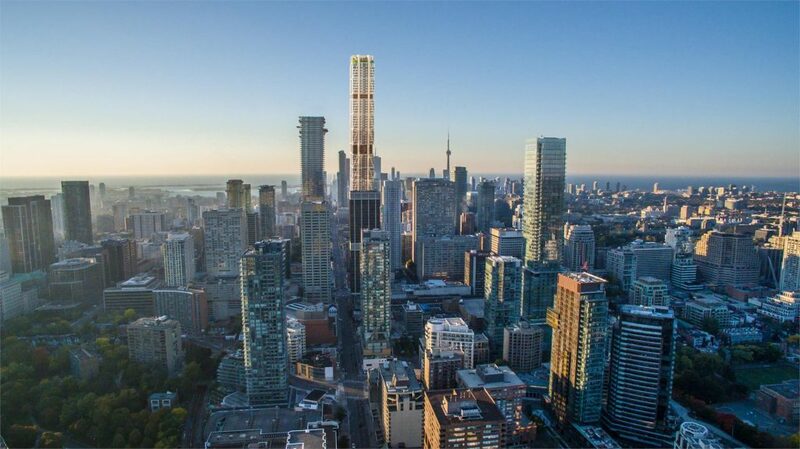 Soaring 85 storeys with 416 suites — an homage to the Toronto area code — THE ONE will feature ground-level retail stores and condo residences ranging in size from 591 square feet to 8,000 square feet. 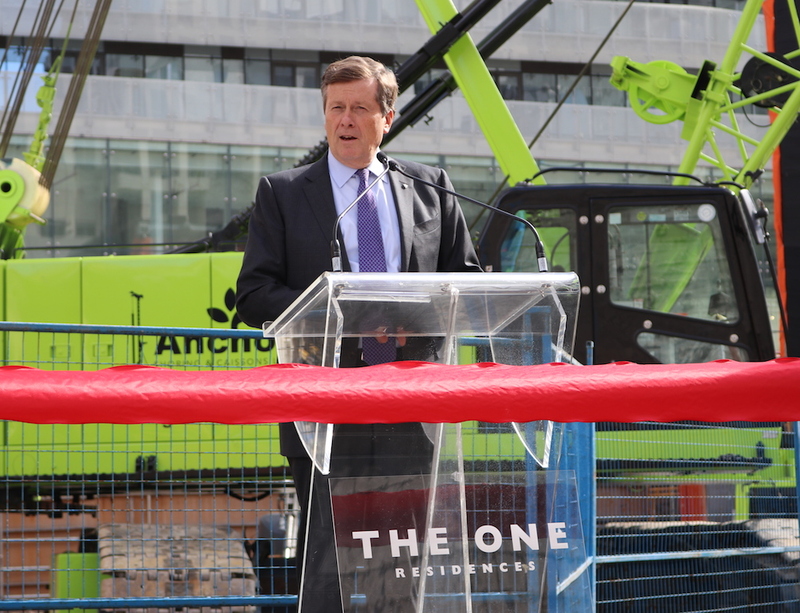 Mayor John Tory participated in today’s event and called THE ONE a testament to the growing city. 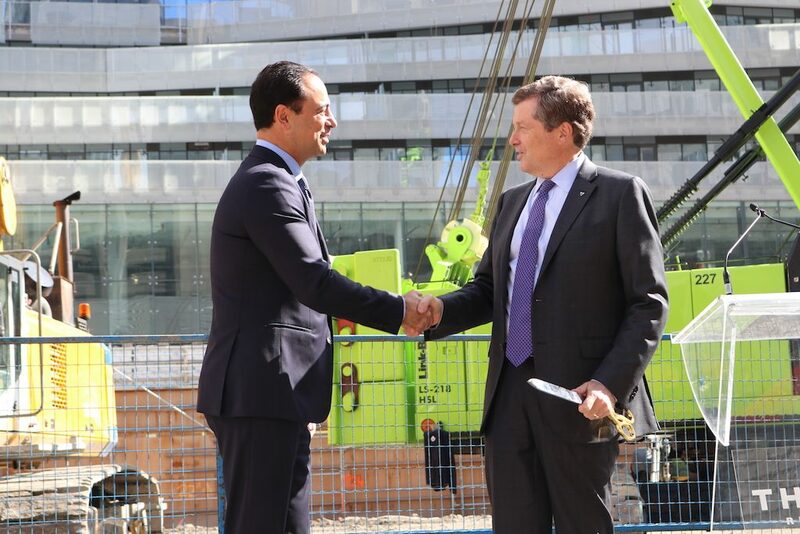 “This development represents Toronto — we are a booming city and we are ambitious and bold. 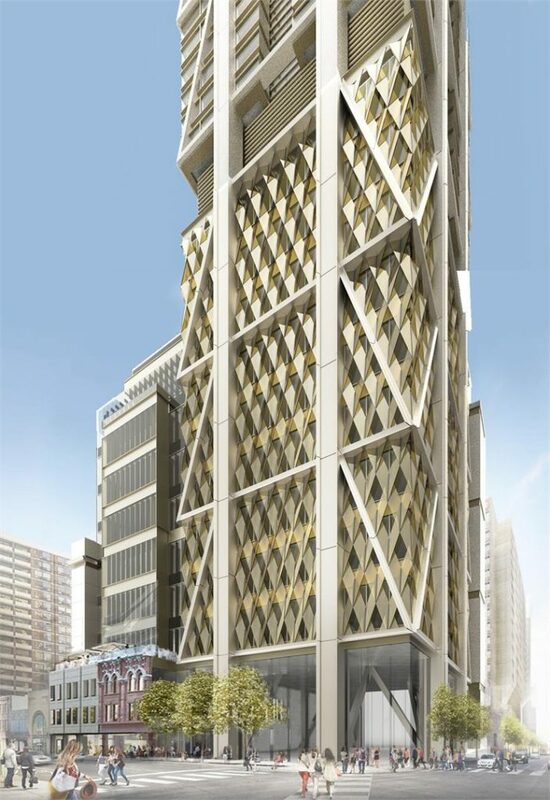 I want to applaud Mizrahi Developments and architects Foster + Partners for their grand vision for One Bloor West and for our city,” says Tory, in a press release. With eight-mega columns and a hanger frame that will create a triangulated form, the tower’s height and slender aesthetic will make it truly standout in the city skyline. “Yonge and Bloor is one of the most iconic intersections in the city and arguably the country. Mizrahi Developments has a responsibility to deliver something Canada hasn’t seen before and we’re grateful and excited to get started,” says Sam Mizrahi, Founder of Mizrahi Developments, in a press release. Designed by the renowned Foster + Partners, THE ONE will boast many innovative and sophisticated design features. For example, typically condo towers have an elevator core that comes through to ground level, but at THE ONE, all of the elevators will be located in a separate core. This separation will allow for the 8,500 square-foot base of the tower to be open and seemingly structure-free. “When you’re moving on Bloor and Yonge and you come to this key intersection with Canada’s tallest building, what you will experience is a grand space, an urban room, with 33-foot ceilings, unimpeded sightlines and extensive transparency,” says Giles Robinson, lead project architect from Foster + Partners, in a press release. Condos begin at 100 feet in the air with a sky-lobby that is accessible through private elevators. Upon entrance into the lobby-level residents will be greeted by a bellhop and concierge. THE ONE’s amenities include a 2,000 square-foot rooftop swimming pool, an adjoining year-round garden terrace, a private gym and spa. The structural frame that characterizes the exterior of the building will be mimicked in the condos as well. Design finishes include diagonal lines, clad in bronze alloy and a window facade that will have a tinted brown glass to complement the warm aesthetic of the building. “We’ve also introduced integrated benches around the perimeter of the units to invite residents to sit up close by the windows and enjoy the unmatched views,” says Robinson. In addition to its unique design, THE ONE will also feature a state-of-the-art LED lighting system from Japan. Hidden within the building’s construction, the lights will appear as a glow and can produce different colours. To learn more about THE ONE, click here to register for the latest updates.